Jenny Greger, 17, says she was “born into the sport of dog mushing. My father has been mushing for 20 years. She says her first sled dogs were originally from a rescue and these dogs and their offspring make up her team of Alaskan Huskies and Belgian Shepherd/Alaskan Husky cross. “My number one priority is the health and happiness of my team and in the last three racing seasons, I have received six Best Cared for Team/Humanitarian Awards. 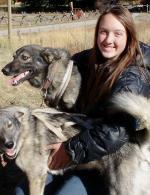 She has participated in the last two Jr. Iditarods, finishing 5th each time. In 2011 she was the top placing rookie and in 2012, she received both the Humanitarian and Lead Dog Awards. In addition to the Jr. Iditarod last year, she ran the Jr. Race to the Sky and the 100 mile Eagle Cap Extreme. Jenny is in 12th grade and is homeschooled. After graduation she plans to go to college and says she definitely will continue dog mushing. She lists her hobbies as dog obedience and agility trials.